Studies of evolution at the molecular level have experienced phenomenal growth in the last few decades, due to rapid accumulation of genetic sequence data, improved computer hardware and software, and the development of sophisticated analytical methods. The flood of genomic data has generated an acute need for powerful statistical methods and efficient computational algorithms to enable their effective analysis and interpretation. 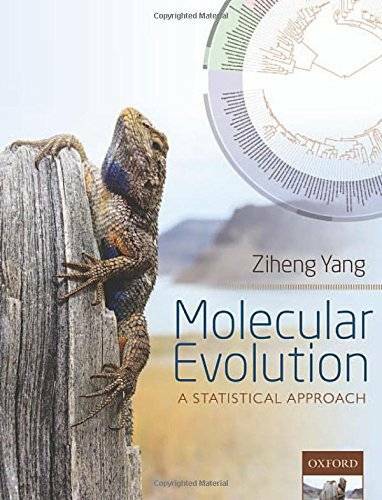 Molecular Evolution: a statistical approach presents and explains modern statistical methods and computational algorithms for the comparative analysis of genetic sequence data in the fields of molecular evolution, molecular phylogenetics, statistical phylogeography, and comparative genomics. Written by an expert in the field, the book emphasizes conceptual understanding rather than mathematical proofs. The text is enlivened with numerous examples of real data analysis and numerical calculations to illustrate the theory, in addition to the working problems at the end of each chapter. The coverage of maximum likelihood and Bayesian methods are in particular up-to-date, comprehensive, and authoritative. This advanced textbook is aimed at graduate level students and professional researchers (both empiricists and theoreticians) in the fields of bioinformatics and computational biology, statistical genomics, evolutionary biology, molecular systematics, and population genetics. It will also be of relevance and use to a wider audience of applied statisticians, mathematicians, and computer scientists working in computational biology.